Two men are photographed seated together. 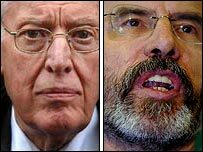 The world of Northern Ireland politics applauded the fact that DUP leader Ian Paisley had consented to sit in the same room with Sinn Fein leader Gerry Adams. I am reminded of a handshake between Israeli and Palestinian leaders all those years ago at Camp David. The handshake was grudging. The world applauded the fact that it had taken place. Yesterday, the body language was no more comfortable. Nick Robinson, that most urbane of political correspondents, hailed the momentous nature of the event. Brown: Offers another £1 billion to NI if deadline holds. Leaders we Deserve: Deadline threat is a weak ultimatum. Everyone expected delays to the last moment. Where’s the Golden Bridge? Is a deadline a good idea? In general, in leadership studies, the dynamics of deadlines has not received the attention it deserves. In some contrast, it is a topic of great interest to decision analysts, economists, and project managers. I had returned to the recent cultural whipping-boy, Game Theory, earlier castigated in The Trap. Researchers into economic rationality term the key issue that of the Principal/Agent problem. This quickly gets complex enough even when working with the start-up case of a single ‘boss’ or Principal, and a single employee or agent. In his Theory of Optimal Deadlines, Flavio Toxvaerd demonstrates the complexities even when dealing with the simple case (rather than the political situation with several Principals and Agents). To summarize, Principal Agent theory begins (as the Trap indicates) with the assumption that Agent and Principal will always act to protect their own self-interests. The theory builds in information asymmetry and the universal temptation of the Agent to avoid unpleasant actions even if this leads to ‘moral hazard’. While agents may appear to be irrational, this may be explained in various ways. Some of the irrationalities may be minimised by the contractual introduction of incentives for aligning the wishes of Boss and agent. However, as Toxvaerd reminds us, estimates of deadlines are notoriously bad in practice. His theorizing suggests that contracts too often fail to offer sufficient incentives for the agent. If you impose deadlines for some action to be completed, make sure the payoffs are as far as possible aligned with the interests of the agent. Extrapolating to the political case, try to find an alignment of the interests of the major players. What non-economists call win-win outcomes. These ideas suggest that change is more likely if deadlines are consensual rather than imposed. The story will also be remembered for the common enemy identified by Paisley and Adams. It turned out to be a threatened Water Tax, brandished by Peter Hain as a bit of legislation from the European Parliament. (Trickle-down economics indeed). And maybe, just maybe, the deadline was quite a good idea, in order to provide something to be challenged and defeated by the Northern Ireland leadership. As of today, political progress seems to have been taking place, and been seen to have been taking place in Northern Ireland. Less than a month ago he talk was of ‘a battle a day’. Now, ‘the audacity of hope’ is a little more on the agenda. The Trap explores the impact of game theory on contemporary life. It suggests how such social beliefs and actions may be helping create the leaders we deserve. 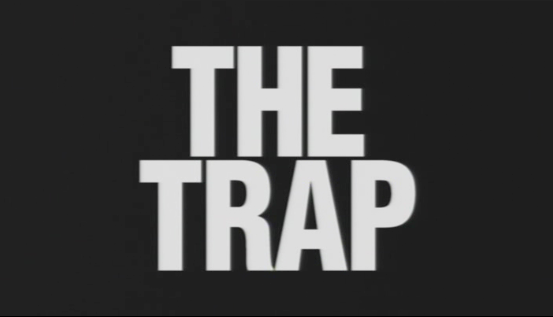 The BBC TV series, The Trap, promises to become a cultish success. Before its first broadcast, web-surfers were alerting their networks to its importance. Part 1 of 3, F**k You Buddy: A series of films by BAFTA-winning producer Adam Curtis that tells the story of the rise of today’s narrow idea of freedom. It will show how a simplistic model of human beings as self-seeking, almost robotic, creatures led to today’s idea of freedom. This model was derived from ideas and techniques developed by nuclear strategists during the Cold War. It was then taken up by genetic biologists, anthropologists, radical psychiatrists and free market economists, until it became a new system of invisible control. Lumbering along after the trend-setters, I caught up with the second episode last Sunday. Curtis offers his thesis in a way that is likely to promote discussion. The web community offers its increasingly significant early indications of beliefs and arguments. Discussion has tended to polarise, with contrarians positive towards the programme for its revelation of the dystopian conditions in a globalizing culture. In the UK, The Guardian offered about as thorough a critique as could be hoped for. Sometimes the blogging discussions transcend the traditional efforts of journalists, but Oliver Burkeman’s piece is a hard act to follow. the paranoid theories hatched during the cold war would come to inspire a peculiar, cold-hearted idea of personal freedom – one that helps explain everything from the rise of Prozac and Viagra to Labour’s obsession with healthcare targets, from the military crusades of George Bush and the rise of the Iraqi insurgency to the rampant diagnosis of attention deficit disorder in children. Burkeman captures one strong concern of some bloggers subsequently, that Curtis engages in ‘conceptual long-jumping’. He, like the bloggers, picks up on Curtis’ treatment of the beliefs of radical psychiatrists. The Trap presents R D Laing as contributing to the belief that madness is totally a socially constructed phenomenon. This may, or may not be what Curtis believes. His approach permits him to present himself as committed to a defense of individual freedom and leaving the viewers to take the debate forward. I take Burkeman’s point, while feeling (in common with a view expressed in other blogs about the programme) that the Curtis perspectice can not be completely dismissed. Critical theorists such as Gibson Burrell and David Collins have been plugging away in a similar vein in their examination of received wisdom of leadership and organizational studies. They argue that the dominant paradigm severely distorts and diminishes the complexities of human beings engaged in working and organizing. Judging from the comments they have provoked, the programmes have succeeded in helping (making?) people ‘pull back’, the better to reflect on wide social trends. They may also help us reflect on cherished notions of leadership. The broad thrust of the argument is that an influential intellectual movement has, for several decades, reduced human behaviour to a kind of Hobbesian self-interested scrabble. From such a perspective, leadership is a construct of social control, cynically espoused for self-interested motives. 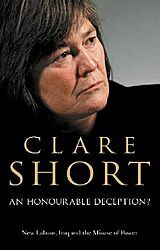 It aligns with the theoretical perspective that all politicians are ‘only out for themselves’, and that claims to be acting out of a ‘higher’ sense of duty are efforts to manipulate. This is in precise opposition to the humanistic psychologists such as Abe Maslow and Carl Rogers. In an earlier blog I suggested that the ideas of Carl Rogers provided a rationale for trust-based leadership. I could have added that humanistic psychology also lies at the heart of the new leadership paradigm, and the idea of the transformational leader, elevating the moral and social sensitivities of the wider social group. From a Hobbesian or Rogerian perspective we end up with leaders we trust. Hobbesians expect and respect one kind of ‘strong’ leader for exercising social control; Rogerians another frespected for removing impediments to moral development. In either case, we end up with leaders we create, sustain, and deserve. You are currently browsing the archives for the The Trap category.